This is an Icelandic name. The last name is a patronymic, not a family name; this person is properly referred to by the given name Guðbrandur. Guðbrandur published the first complete Icelandic translation of the Bible in 1584. Guðbrandur Þorláksson (or Gudbrandur Thorlaksson) (1541 – July 20, 1627) was an Icelandic mathematician, cartographer and clergyman. He studied at the cathedral school in Hólar and then at the University of Copenhagen. He and was successively rector of the school at Skálholt and minister at historic Breiðabólstaður in Vesturhóp. The first laws of Iceland had been written at Breiðabólstaður. The bar association of Iceland has erected a memorial by the site. 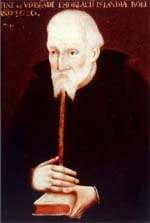 Guðbrandur Þorláksson was Bishop of Hólar from 1571 until his death on July 20, 1627. During his time as bishop, Guðbrandur edited and published at least 80 books, including the Bible in Icelandic and the Icelandic Lawbook or legal code. He is also noted for having drawn the first good map of Iceland, published in Abraham Ortelius' Theatrum orbis terrarum in 1590. He had at least one child, a daughter named Steinunn, born in 1571 to Guðrún Gísladóttir. Guðbrandur Þorláksson is pictured on the now obsolete Icelandic 50 króna banknote. This article incorporates text from a publication now in the public domain: "Thorláksson, Gudbrandur". (1911) Encyclopædia Britannica (Eleventh ed. ).Cambridge University Press. "Bible of Guðbrandur Þorláksson". Archived from the original on November 5, 2004. Retrieved January 30, 2005.